In his first 'Painting Diary', featured exclusively on the Studio 88 website, Graham Turner invited you to follow his progress as he created 'The Arrivall' - one of his medieval oil paintings. Using stage by stage photographs and an informative commentary, the painting diary guides you through the processes that transform a blank canvas into a finished painting, shedding light on Graham's approach and techniques. Click here to see 'The Arrivall' painting diary. This proved so popular that Graham was persuaded to invite you to join him once again as he went through the highs, and occasional lows, of putting his ideas onto another canvas. 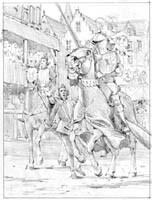 Inevitably, considering his personal involvement in jousting, Graham found himself inspired to record something of the excitement and spectacle of the medieval tournament, and the preliminary sketch shown here gives an idea of how he recorded his initial ideas. See how the painting evolved from this rough sketch and discover how much work goes into the creation of one of his detailed historical pictures. Click here to see 'The Joust' painting diary.